November 10, 2018, Jupiter, FL – Six months of training, six months of competing, six months of bonding came down to one critical pitch in the 2018 Fall Classic 45 Central Championship game. Clinging to a two-run, eighth-inning lead, Susquehanna Valley pitcher Joe Lockhart found himself in a precarious situation. In his second inning of work, he’d loaded the bases in relief of starter Scott Hiers and was now facing Connecticut Top Hats star hitter Manny Reasor. Lockhart never flinched. The big righty, already with a pair of tournament victories to his credit, got Reasor to hit a comebacker that ended the inning and, even with an inning to play, definitively stamped the Hitzmen’s name to their first title with a 5-3 decision. 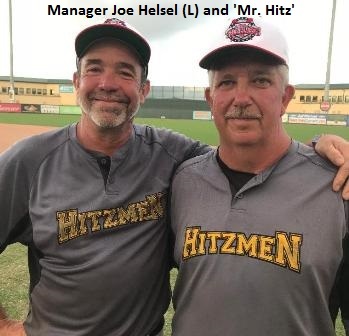 Winning their first championship was far more than Helsel and the Hitzmen ever expected, so it wasn’t surprising when the manager said the full impact of the accomplishment hadn’t yet been realized. He said the team’s objective was to simply “get to Saturday,” thereby earning an opportunity to reach the tournament’s semifinal round. Susquehanna Valley did itself one better by completing round-robin play with an unblemished 5-0 record and defeating the Bux-Mont Cubs, 6-4 in the playoffs. Once there, the Hitzmen made sure an early deficit wouldn’t keep them from the title. 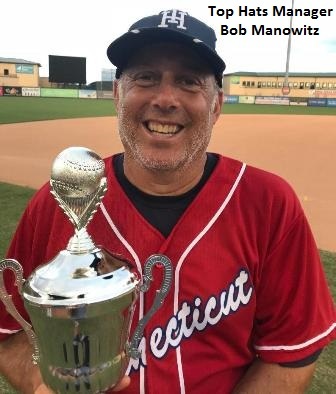 Connecticut, which lost the 2016 championship game on a seldom seen walk-off balk, grabbed a 1-0 second-inning lead when Reasor reached via error, moved to second on a sacrifice bunt and scored on Bob Manowitz’s clutch two-out single to left. It took just the bottom half of the inning for the Hitzmen to answer. Paul Robinson and Greg Garner led off with singles to put runners on first and third. Robinson scored on the back end of a well-executed double steal and Garner later took third on a ground out. Then, with a large lead, Garner drew a wild throw from home that sailed into left field, allowing him to score easily and take the lead. Back-to-back leadoff singles in the bottom of the third from Charles Dean and Barry Williams helped push the lead to 3-1 when Helsel lifted a sacrifice fly to left. Meanwhile, Hiers kept Connecticut hitters off balance throughout. He earned the victory by tossing six innings of seven-hit, two-run ball before giving way to Lockhart. Hiers’ effort was the last in a week full of outstanding pitching. The Top Hats, who completed round robin play 4-1 before outscoring the New York Isotopes 14-11 in the playoffs, ran themselves out of a chance to tie the game in the fifth when Billy Bardes, who’d singled home Manowitz earlier in the inning, was thrown out at the plate on their own attempt at a double steal. While Connecticut starter Rich Burns more than held his own throughout, the Hitzmen finally pushed across the two runs that gave them some much-needed breathing room in the seventh. Unfortunately for the Top Hats, they provided plenty of support. Chris Dixon walked and Todd McCormick’s sacrifice bunt turned into first and third when the ball was misplayed for an error. After McCormick stole second one out later, a grounder to third resulted in everyone being safe when a rundown failed to produce an out. The fielding mistake proved disastrous when both Lockhart, who hit .500 for the tournament, and Helsel hit run-scoring singles. “We threw the ball around a little and made some physical errors, but for a team that didn’t know if it had a pitcher available before the game, we’re happy with our performance,” Manowitz said. WP: Hiers (2-0). LP: Burns. Pitching: Burns and Lambros (C). Hiers, Lockhart (7) and Hopwood (S).